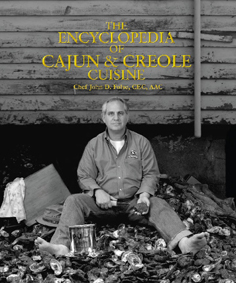 Chef Folse's seventh cookbook is the authoritative collection on Louisiana's culture and cuisine.The book features more than 850 full-color pages, dynamic historical Louisiana photographs and more than 700 recipes. You will not only find step-by-step directions to preparing everything from a roux to a cochon de lait, but you will also learn about the history behind these recipes. Cajun and Creole cuisine was influenced by seven nations that settled Louisiana, from the Native Americans to the Italian immigrants of the 1800s. Learn about the significant contributions each culture made-okra seeds carried here by African slaves, classic French recipes recalled by the Creoles, the sausage-making skills of the Germans-and more. Relive the adventure and romance that shaped Louisiana, and recreate the recipes enjoyed in Cajun cabins, plantation kitchens and New Orleans restaurants. Chef Folse has hand picked the recipes for each chapter to ensure the very best of seafood, game, meat, poultry, vegetables, salads, appetizers, drinks and desserts are represented. From the traditional to the truly unique, you will develop a new understanding and love of Cajun and Creole cuisine. The Encyclopedia would make a perfect gift or simply a treasured addition to your own cookbook library. Copyright © 2007 Chef John Folse & Company.